EAW015655 ENGLAND (1948). 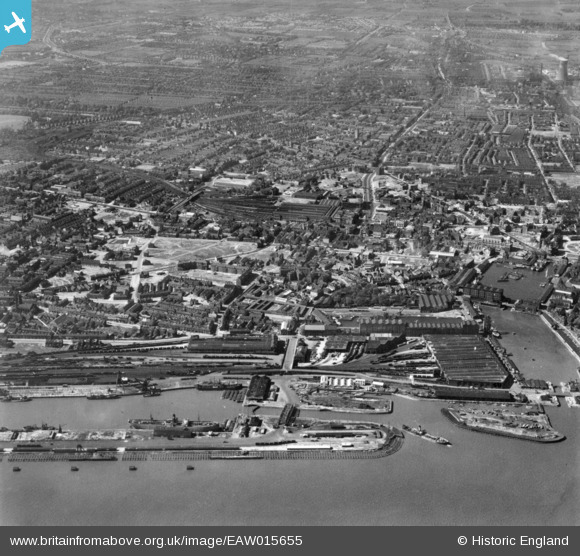 The city around Albert Dock Basin and Paragon Railway Station, Kingston upon Hull, from the south, 1948. This image has been produced from a print. Pennawd [EAW015655] The city around Albert Dock Basin and Paragon Railway Station, Kingston upon Hull, from the south, 1948. This image has been produced from a print. Location of WW2 HAA Gun Battery accommodation, the gun pits possibly just visible to the right. Chanterlands Avenue, designation number A/H29. Please notice the large areas of "cleared" ground. Hull was the most heavily bombed city in the UK after London in WW2.